Tiny Gorham, N.H., at the base of the White Mountains, has only about 13,000 people. But Ed Watson, general manager of the Berlin City Auto dealership, attracts customers from Vermont, Maine, New York and Massachusetts. To outsiders, the Berlin City Auto dealership in Gorham, N.H., may seem like it's in a limited market. It's in a rural area with about 13,000 people nestled at the base of the White Mountains, where winters are snowy and cold. And the local economy is reeling from the closure of two paper mills in recent years. But the dealership, with 10 domestic and foreign franchises, mostly has thrived for a quarter century -- currently with a business model developed more than a decade ago and turbocharged by the Internet age. 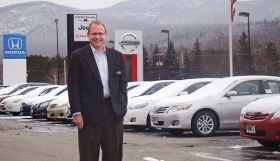 The dealership, run by General Manager Ed Watson, leapfrogs the local market by using color catalogs to build a customer base as far as 12 hours away in Vermont, Maine, New York and Massachusetts. As a result, about 40 percent of vehicle sales are to customers who use phone and e-mail to discuss purchases while never setting foot in the store. Berlin City Auto also combines aggressive pricing with personal services such as delivering cars and picking up trade-ins. A number of long-distance customers who were drawn to the store by word-of-mouth now sing its praises. "We have lots of car dealers in our area, but none can offer the deals and service of Berlin City," says Gordie Little, 72, a journalist who lives four hours away in Morrisonville, N.Y. The entire five-store Berlin City Automotive Group in New England relies heavily on long-distance sales. It consists of the Gorham store run by Watson; a smaller General Motors outlet a mile away; two dealerships in South Portland, Maine; and one in Williston, Vt. The group's owner, Summit Automotive Partners in Denver, is considering expanding the marketing technique to all 15 of its outlets in Colorado, Tennessee and New England, says Summit CEO Rod Buscher, one of the group's owners. The controlling partner at Summit is George Gillett, an American businessman who once owned the Montreal Canadiens professional hockey team and now owns the Liverpool professional soccer team in the United Kingdom and the Richard Petty Motorsports NASCAR auto racing team. At Watson's store in Gorham, profit is expected to rise 40 percent this year -- back to 2006 and 2007 levels -- after the store laid off a handful of employees, cut back on inventory and advertising and expanded the number of insurance products offered. The profit rebound is occurring in the face of a recession that has caused revenue to tumble 24 percent from $144 million in 2008 and 33 percent from $165 million in 2007. "This has been a strong bounce-back year," says Watson, 39, a Gorham native who has run the dealership for three months. Since 2007, vehicle sales at Watson's store have plunged 36 percent to an expected 2,839 this year. New-car sales, which traditionally account for about 80 percent of the store's volume, are down to 77 percent this year. For the five-store Berlin City Automotive Group, unit sales have fallen 32 percent during that period. New-vehicle sales account for about 65 percent of their total. Berlin City Auto, which has 107 full-time employees, relies on an unusual mix of workers. It draws on a free-lance squad of three dozen drivers who deliver vehicles to customers' homes, collect their signatures on the contract, and drive trade-ins back. Little, whose extended family has bought about two dozen Toyotas from the dealership over the last decade, has never visited the New Hampshire store. "You negotiate by phone for a few hours and then they say, when do you want it -- tomorrow?" Little says. "Come on, how can you beat that? They come to your house, you sign the paperwork at the kitchen table over coffee, and they drive your used car away." After the delivery, customers have four days to change their minds and request a pick-up, though that rarely happens, Watson says. Most drivers are retirees from the local area. They are equipped with GPS systems and are given the option of staying in motels on overnight drives. "I do it to keep busy," says Rodney Sawyer, 75, a retired real-estate broker who is paid the minimum wage for driving as many as 12 hours in a single day and 40 hours a week. "Driving to me is simple, and there's usually no traffic to speak of." The store also has four full-time workers who produce a 20-page tabloid each week that is tucked into 26 New England newspapers, such as the Burlington (Vt.) Free Press and The Conway (N.H.) Daily Sun. The catalog consists of hundreds of color photos of new and used vehicles, along with capsule descriptions and prices. The dealership also posts online photos of every used car for sale. General Manager Ed Watson says Berlin City Auto's business model originated with the store's founder, who knew "we couldn't grow in our market because it was landlocked and isolated." The long-distance business was pioneered by the group's founder, Dan Dagesse, who bought a single-point Ford store in 1983. He acquired several others with domestic and import franchises in Maine, Vermont and New Hampshire, leaving the closest competitor 45 miles away from Gorham. Dagesse's original group now makes up Berlin City Automotive Group. While business was pretty good for a while, it really took off in the mid-1990s when Dagesse started some of the marketing techniques still in use today, Watson says. "Our founder realized we couldn't grow in our market because it was landlocked and isolated," he says. 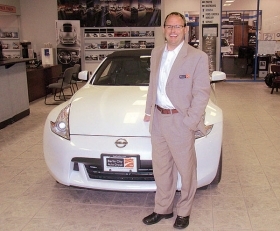 Two years ago, Dagesse sold his stores to Summit, which owns 15 dealerships with 33 franchises. During the dealership's formative years, Watson attended Gorham High School, where his 1988 graduating class had 40 students. He met his future wife there and left town to attend the University of New Hampshire. When he returned with a business-management degree in 1991, a friend persuaded him to apply for a sales job at Dagesse's General Motors store in Gorham, which now sells Chevrolet, GMC and Buick brands. Watson rose quickly through the ranks, becoming used-car manager after 10 months and sales manager after another year. He was promoted back and forth between the GM store and the bigger dealership he now runs, becoming general manager last summer. Watson works 63-hour weeks and tries to squeeze in mountain hikes with his two young daughters when he can. Gazing out his office window, Watson can see Mount Washington, the highest peak in the northeastern United States, just eight miles away. Says Watson: "Growing up, I was aware of this store but probably didn't pay much attention to it. I certainly didn't imagine that one day I'd be running it."